Above: The Hondros family. 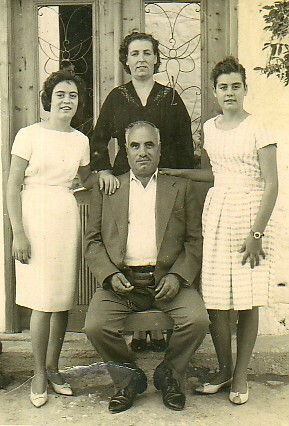 With my parents, Efstratios and Lesvia, and my sister, Eleni (left). 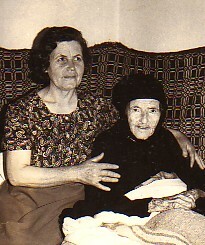 Above Right: My maternal grandmother, Aphrodite (Gelagotou), who was from Agiassos- and my aunt, Posoula (Koutsou). Above: Learning how to sow. From left, we are: Maria Kountsia, Giannoula, myself, our teacher, Ralou, Maritsa Gelagotou, Maria Tsipni and Zaharitsa Marouli. Circa 1957. Above Right: At the neighbourhood, Sidirodromos. Back row from left are: Krystalenia Koumninaki, Zaharitsa Marouli, Elli Spyrelli, Giannoula Gelagotou, Maritsa Marouli and Olvia Kabouri. In the front row are: Astiropi Marouli, my sister, Eleni, Adamandia, Marianthi Gelagotou and her grandson, Panagiotis, Efstratia Kabouri and myself. Circa 1964. Above: Playing amades in the neighbourhood. From left, we are: Giorgos Kabouris, unknown, Giannoula and Panagiotis Gelagotou, unknown, my sister, Eleni, Olvia Kabouri, myself, Stella Balelou, Zaharitsa and Maria marouli, Elli Spyrelli and Ariadne Matarou. Above Right: The Demertjis family. With my husband, Ioannis, and our sons, Stylianos, Efstratios and Eleftherios.